Giveaway Winner #2: Dinosaurs have a new home...Beware! Beware Five Foot Mama...Dinosaurs are on the loose and on their way to you! I'll be emailing you to get your info! The winner was #16 out of 26 entries (my husband's comment didn't count! ), according to the "truly random number generator" . Keep checking back for our next giveaway...It's gonna be a good one! My mother says I would sell her on ebay if I could. That's just simply not true. But I did sell my used nursing bras once. And someone bought them. For like, $23. All together now...EEEWWWWW! When it comes to selling your junk on eBay, timing is certainly everything. Don't sell your swimsuits in November. Don't sell your Christmas dresses in March. And please, whatever you do, don't have your current listings end during American Idol's season finale like me...that would just be plain idiotic! Sigh. I digress. January: Toys! Yep, people are still buying them. And you are still getting close to top dollar because people are still giving last minute or belated holiday gifts. February: Start selling your summer clothes! Don’t forget Easter dresses. March: Sell small things that fit into Easter baskets, Spring and Summer Clothes. April: Pool and Beach items. May: Things that might make nice Mother's Day gifts, like your old Vera Bradley Bags. June: Things that might make nice Father's Day gifts, like...well, I never know what to get my father on father's day. July: Back-to-School Backpacks, lunchboxes, and your name brand children's clothes and shoes. Personalized items are good too. September: Start to organize your toys for selling during the Christmas season. October: Begin to sell your Christmas and Holiday outfits, toys too! November: TOYS, toys, and more toys. Holiday outfits, too. December: You'll get top dollar for your kid stuff, but don't cut it too close--allow enough time for shipping! Please note: It's always a good time to sell things your kids no longer want/need (and things YOU no longer want) to clean out the house and get rid of clutter. There are always birthdays happening and moms out there shopping for gifts! Often selling your things on eBay will bring you MUCH more money than you can get by selling them at a yard sale. I'll leave you today with one special What to Sell Wednesday item. It's the Mickey Mouse Clubhouse, and it's as good as gold. Do you have one of these? If so, check out this completed listing! It just sold yesterday. Now go sell something! After a huge week last week, this week was a bit more tame. But that's okay. Each Saturday morning I thank the Lord when I find anything that my girls can use or I can sell to make a little extra money. I found lots of little things here and there, but I did find one yard sale that made the gas money worthwhile. Can you say spoiled well-loved? All of this came from one yard sale. 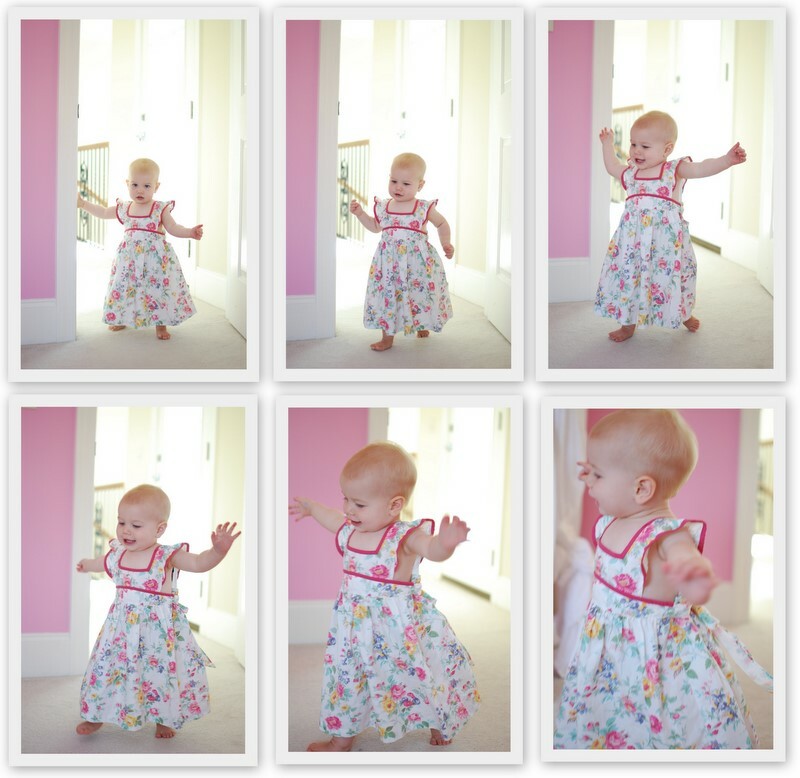 This little girl had everything ever made for Dora, and for Barbie and the Dancing Princesses. You thought Ken was the man--he's got nothing on Prince Derek! Ken just had Barbie. Derek has 12 dancing princesses at his disposal. The dolls look like they were hardly ever played with. Every shoe, ribbon, crown, necklace, and accessory was saved. My girls were never into Barbie...maybe this girl wasn't either! Did anyone else LOVE this book? I was a huge Sesame Street fan. I hope you had a good weekend. Don't forget to enter the giveaway! Today's giveaway is super fun. In fact, the girls were not happy that today's giveaway toy is, sadly for them, a giveaway toy. 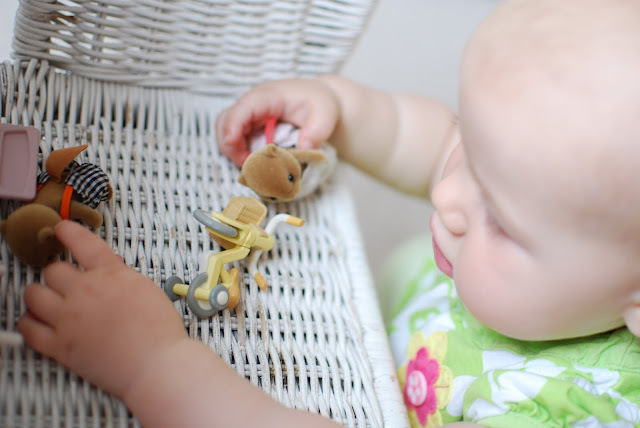 But my kids know in our little world toys are here today and gone tomorrow, so they have to enjoy them while they last! Please don't be scared of our new friend. She's just protecting her nest. Mama tried to intimidate the good doctor. Then she tried to intimidate the baby. But the baby showed her who's boss. And tamed the wild beast. And, as always, baby slobber is included. It's just a little something extra I like to throw in. However, if you're still scared, perhaps you'd rather play it a bit more conservative and just go for the books. 8 American Girl Doll Books are up for grabs, too. 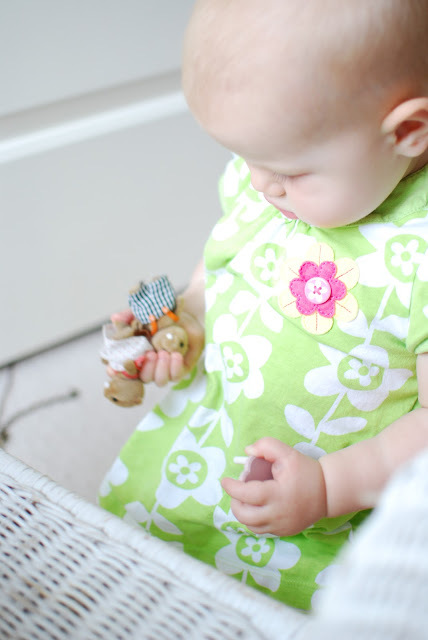 We're huge American Girl fans around here. With three girls that is no surprise. In fact, we are even part of a neat American Girl Doll Book Club. 1. Become a follower of my blog! 2. Leave me a comment to let me know that you did, and let me know which prize you'd like if you win. 3. Check back next Wednesday night/Thursday morning to see if you're the winner. Or, leave your email address in the comment so I can contact you. If you win, I'll send you your prize if I don't know you or give it to you next time I see you if I do. Good luck! THIS GIVEAWAY IS NOW CLOSED. Giveaway Day! 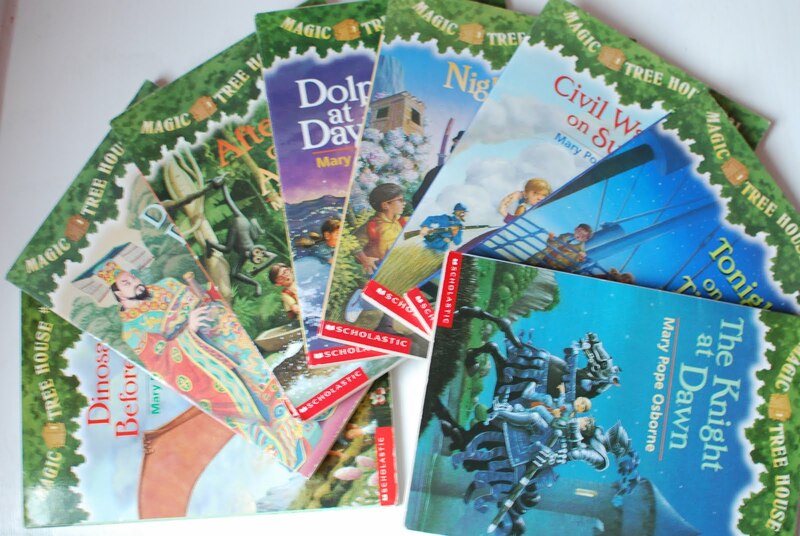 One man's junk could now be your treasure: Magic Tree House Books or Calico Critters! By the end of yard sale-ing (is that a word? if it is I don't know how to spell it!!) last Saturday I had a car full (well, a Honda Civic full) of stuff. Certainly I have enough to share! 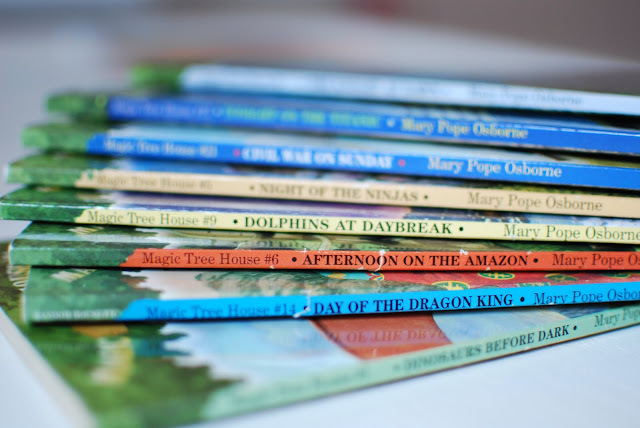 Each week I thought I would give away one special thing I found to a reader (and since there are only two of you, your chances are pretty good I would say). To enter to win, simply leave a comment and let me know which gift you would like. If I know you, I'll make it a point to see you soon if you win! If I don't know you, I'll get your address and ship it to you! It's that simple. Are you ready? Here's what you can win, Bob! 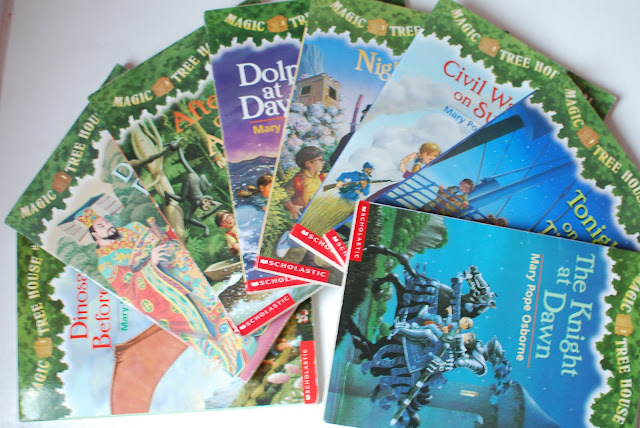 8 Magic Tree House Books! Retail value: $32. My yard sale cost: $2. Who doesn't love Jack and Annie? Or, if you would prefer, how about adpoting a nice little Beaver Family? 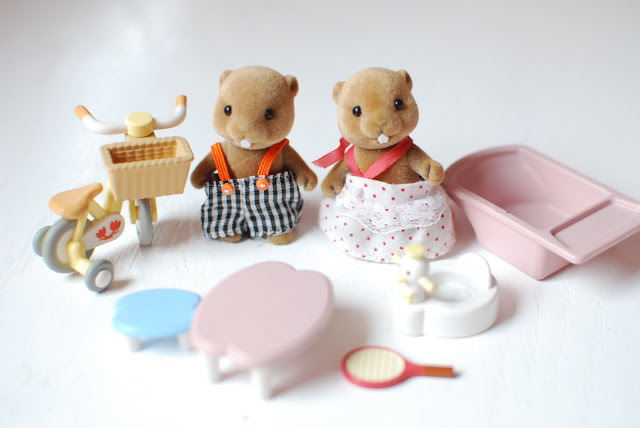 Meet Brother Beaver and Sister Beaver, of the Calico Critter Family. Retail value: expensive. My cost? $1. A winner will be picked randomly next Wednesday. Good Luck!